"Historically, domestic violence programs were born from the women’s liberation movement of the 1970s to address the needs of female survivors, who still represent the majority of victims seeking services today. Generally, the domestic violence movement has framed its work on a gender binary with men as perpetrators and women as victims. We have come to learn, however, that a woman-centered approach to advocacy only addresses the needs of a portion of survivors and largely fails to acknowledge and address male victimization." 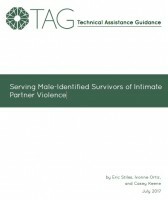 A resource developed by the National Resource Center on Domestic Violence, this Technical Assistance Guidance supports advocates seeking to build capacity to recognize and respond to survivors across the gender spectrum, while honoring the gender analysis that helps us understand the root causes of violence and oppression.